For gutters and downspouts you can rely on to protect your home in Albuquerque, or any other nearby community in New Mexico, from damage caused by improperly channeled water, turn to ABC Seamless of Albuquerque. We’re the company offering worry-free protection with steel gutter products engineered to withstand the powerful winds and torrential rain that we sometimes see in our area. We send thoroughly trained technicians to custom manufacture our seamless gutter and downspout products onsite at your home, using precise measurements to create sturdy, leak-proof gutter systems that will perform well into the future. 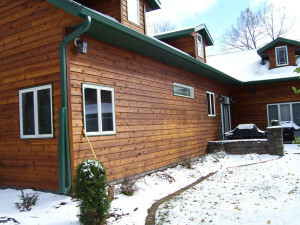 Our gutter systems can handle approximately 33 percent more water than K-style aluminum gutters. We engineer our products out of 28-gauge, G-90 galvanized steel, providing exceptional strength and resistance to dents or creases. Our products are available in nearly 30 exciting colors, so you’ll be sure to find one that enhances your home’s curb appeal. Additionally, our products are designed to blend in with your soffit and fascia systems for a pleasant appearance. We even offer attractive rain barrels to collect the water running through your gutter system to provide you with water for eco-friendly lawn maintenance. To learn more about the gutters and downspouts, as well as all the other durable steel products we offer to homeowners in Albuquerque, NM, and all surrounding areas, contact ABC Seamless of Albuquerque today.